Such light and brilliance in the blue! The black sets it off perfectly, and both are shaded and folded so well that it's hard to believe that this is not a real dress! How do you manage to use shading to make such a brilliant, bright blue?! It's so gorgeous, as are all the layers of ruffles and the sheer ruffled black lace around her hips and on her bodice. You design such gorgeous and gowns and execute them so flawlessly! I am, as I have always been and I always will be, completely floored and awed by the level of intricacy and beauty in this. 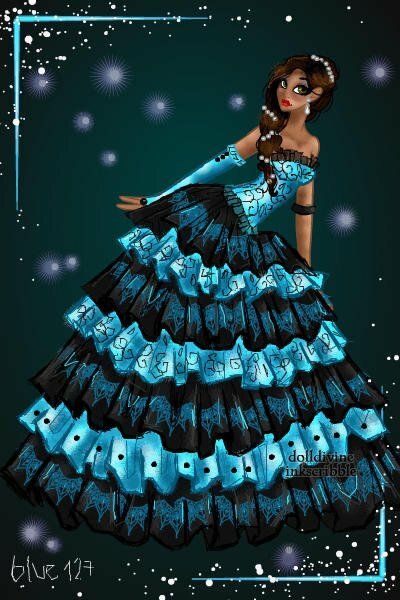 Amazing, I LOVE the color scheme, There is certainly a magical quality to the dress, The shading is superb and all the details you do are always stunning, Yet another one of your dolls that needs an "Amazing" crown. There should be an 'awesome and breathtaking' crown. Your creations, in my opinion, are the only one's I've seen so far worthy or the 'awesome and breathtaking' crown (if it existed). Amazing job. I wish i had a dress like that. love the layers, and the colors match perfectly. the pearls look gorgeous in her hair!